Richard Neville, 16th Earl of Warwick was born on 22 November 1428.1 He was the son of Richard de Neville, 5th Earl of Salisbury and Alice Montagu, Countess of Salisbury.1 He married Lady Anne Beauchamp, daughter of Richard Beauchamp, 13th Earl of Warwick and Isabel le Despenser, in 1434.2 He died on 14 April 1471 at age 42, killed in action, without male issue.2 He was buried at Bisham Abbey, Berkshire, EnglandG. Richard Neville, 16th Earl of Warwick also went by the nick-name of 'The Kingmaker'. He was appointed Knight before 6 August 1445.1 He held the office of Joint Warden of Carlisle and the West Marches towards Scotland in 1446.1 He succeeded as the 16th Earl of Warwick on 23 July 1449.1 He held the office of Hereditary Chamberlain of the Exchequer in 1450, in right of his wife.1 He held the office of Hereditary Sheriff of Worcestershire between 1450 and 1470.1 He was created 1st Earl of Warwick [England] on 2 March 1449/50.1 He held the office of Joint Warden of Carlisle and the West Marches towards Scotland in 1453.1 He was appointed Privy Counsellor (P.C.) before 6 December 1453.1 He held the office of Captain of Calais in 1455.1 He fought in the First Battle of St. Albans on 22 May 1455, commander of the Yorks.1 He fought in the naval actions against the Spaniards and Hanseatic traders from 1458 to 1459, as naval commander.1 On 20 November 1459 he was attainted.1 He held the office of Governor of the Channel Islands in 1460.1 He was appointed Knight, Order of the Garter (K.G.) in 1460.1 He fought in the Battle of Northampton on 10 July 1460, where he lead the Yorkists to victory.1 In October 1460 he was pardoned.1 He held the office of Constable of Dover Castle in 1461.1 He held the office of Warden of the Cinque Ports in 1461.1 He held the office of Lord Great Chamberlain [England] in January 1460/61.1 He fought in the Second Battle of St. Albans on 17 February 1460/61, where he lead the Yorkists to defeat.1 He fought in the Battle of Towton on 29 March 1461, where he commanded the central block of the Yorkist army.1 He held the office of Lord Great Chamberlain in May 1461, for life.1 He held the office of Warden of the East and West Marches towards Scotland in July 1461.1 He held the office of Lord High Steward [England] in December 1461.1 He held the office of Admiral of England in 1462.1 He succeeded as the 6th Earl of Salisbury in 1462.1 In 1469 he suppressed the Lancastrian rising in the North, under his relative Sir Humphrey Neville.1 In September 1470 he proclaimed Henry as king, after switching support from King Edward IV to Henry (VI).1 He held the office of Joint Lord of the Realm in November 1470.1 He held the office of Admiral of England, Ireland and Acquitaine in January 1470/71.2 He fought in the Battle of Barnet on 14 April 1471. On his death, the Earldom of Salisbury reverted to the Crown. [S6] G.E. Cokayne; with Vicary Gibbs, H.A. Doubleday, Geoffrey H. White, Duncan Warrand and Lord Howard de Walden, editors, The Complete Peerage of England, Scotland, Ireland, Great Britain and the United Kingdom, Extant, Extinct or Dormant, new ed., 13 volumes in 14 (1910-1959; reprint in 6 volumes, Gloucester, U.K.: Alan Sutton Publishing, 2000), Volume 12, page 905. Hereinafter cited as The Complete Peerage. [S6] Cokayne, and others, The Complete Peerage, Volume XII/2, page 905. [S6] Cokayne, and others, The Complete Peerage, volume II, page 495. [S11] Alison Weir, Britain's Royal Families: The Complete Genealogy (London, U.K.: The Bodley Head, 1999), page 132. Hereinafter cited as Britain's Royal Families. [S11] Alison Weir, Britain's Royal Families, page 134. [S6] Cokayne, and others, The Complete Peerage, Volume XII/2, page 906. [S6] Cokayne, and others, The Complete Peerage, volume III, page 246. [S6] Cokayne, and others, The Complete Peerage, volume XII/2, page 907. [S6] Cokayne, and others, The Complete Peerage, volume XII/2, page 908. [S6] Cokayne, and others, The Complete Peerage, volume III, page 260. After her marriage, Lady Cecily Neville was styled as Duchess of York before 18 October 1424. From before 18 October 1424, her married name became Plantagenet. She was a nun after 1456. [S11] Alison Weir, Britain's Royal Families: The Complete Genealogy (London, U.K.: The Bodley Head, 1999), page 134. Hereinafter cited as Britain's Royal Families. [S11] Alison Weir, Britain's Royal Families, page 132. [S6] Cokayne, and others, The Complete Peerage, volume XII/2, page 909. 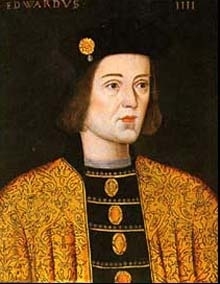 Edward IV Plantagenet, King of England was born on 28 April 1442 at Rouen, Caux, FranceG.2 He was the son of Richard Plantagenet, 3rd Duke of York and Lady Cecily Neville. He was baptised at Rouen Cathedral, Rouen, Caux, FranceG. He married Eleanor Talbot, daughter of General John Talbot, 1st Earl of Shrewsbury and Lady Margaret Beauchamp, circa 1461 in a alleged marriage.3 He married Elizabeth Wydevill, daughter of Richard Wydevill, 1st Earl Rivers and Jacquetta de Luxembourg, on 1 May 1464 at Grafton Regis, Northamptonshire, EnglandG.4 He died on 9 April 1483 at age 40 at Palace of Westminster, Westminster, London, EnglandG.5 He was buried at St. George's Chapel, Windsor Castle, Windsor, Berkshire, EnglandG. [S6] G.E. Cokayne; with Vicary Gibbs, H.A. Doubleday, Geoffrey H. White, Duncan Warrand and Lord Howard de Walden, editors, The Complete Peerage of England, Scotland, Ireland, Great Britain and the United Kingdom, Extant, Extinct or Dormant, new ed., 13 volumes in 14 (1910-1959; reprint in 6 volumes, Gloucester, U.K.: Alan Sutton Publishing, 2000), volume XII/2, page 909. Hereinafter cited as The Complete Peerage. [S11] Alison Weir, Britain's Royal Families: The Complete Genealogy (London, U.K.: The Bodley Head, 1999), page 138. Hereinafter cited as Britain's Royal Families. [S11] Alison Weir, Britain's Royal Families, page 141. [S11] Alison Weir, Britain's Royal Families, page 137. [S6] Cokayne, and others, The Complete Peerage, volume XII/2, page 910. [S4] C.F.J. Hankinson, editor, DeBretts Peerage, Baronetage, Knightage and Companionage, 147th year (London, U.K.: Odhams Press, 1949), page 20 . Hereinafter cited as DeBretts Peerage, 1949. [S18] Matthew H.C.G., editor, Dictionary of National Biography on CD-ROM (Oxford, U.K.: Oxford University Press, 1995), reference "Edward IV, 1442-1483". Hereinafter cited as Dictionary of National Biography. [S6] Cokayne, and others, The Complete Peerage, volume X, page 34. [S11] Alison Weir, Britain's Royal Families: The Complete Genealogy (London, U.K.: The Bodley Head, 1999), page 136. Hereinafter cited as Britain's Royal Families. [S6] G.E. Cokayne; with Vicary Gibbs, H.A. Doubleday, Geoffrey H. White, Duncan Warrand and Lord Howard de Walden, editors, The Complete Peerage of England, Scotland, Ireland, Great Britain and the United Kingdom, Extant, Extinct or Dormant, new ed., 13 volumes in 14 (1910-1959; reprint in 6 volumes, Gloucester, U.K.: Alan Sutton Publishing, 2000), volume III, page 260. Hereinafter cited as The Complete Peerage. From before 30 July 1447, her married name became de Holand. From 1473, her married name became St. Leger. 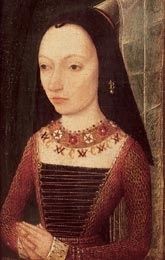 After her marriage, Anne Plantagenet was styled as Duchess of Exeter. [S11] Alison Weir, Britain's Royal Families, page 135. [S11] Alison Weir, Britain's Royal Families: The Complete Genealogy (London, U.K.: The Bodley Head, 1999), page 135. Hereinafter cited as Britain's Royal Families.